Mecklenburg at a speaking engagement, November 2007. Karl Mecklenburg (born September 1, 1960) is a former football linebacker for the Denver Broncos in the National Football League. 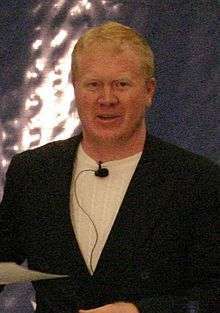 In 1983, the Denver Broncos drafted Karl Mecklenburg in the 12th round with the 310th pick overall. In spite of his low selection, Mecklenburg went on to become an integral part of the Broncos' Super Bowl teams of the 1980s. He played in six Pro Bowls. His 79.5 sacks is the second highest total in franchise history. In 2001, during half time of a game against the Baltimore Ravens, he and Dennis Smith were inducted into the Denver Broncos Ring of Fame. He is also in the Colorado Sports Hall of Fame and serves on the Broncos Alumni Council. Since retiring from pro football in 1994, Mecklenburg divides his time between family, motivational speaking, and his ongoing charity involvements. Karl and his wife Kathi have three children. The Mecklenburgs reside in Littleton, Colorado. The son of Fred Mecklenburg and Marjory Mecklenburg, Karl has two brothers, Eric and Fred, and a sister, Carol. Mecklenburg suffered "at least a dozen +10 concussions" during his football career. By his early fifties, Mecklenburg was experiencing cognitive issues, including memory impairment, which he attributes to the concussions he sustained. Mecklenburg was a plaintiff in concussion-related litigation against the NFL: "I didn't buy in to professional football with the understanding that I was going to have brain damage. I expected to have a limp. I expected to have sore joints. Bad shoulder, whatever. But that other part, that was kept from us and that wasn't right." The digital version of Mecklenburg anchored the 3-4 defense of the Denver Broncos in the NES video games Tecmo Bowl (1989) and Tecmo Super Bowl (1991). Mecklenburg appears in the video game Madden 15 (2015) in the Ultimate Team mode, as a 97 Overall player. Mecklenburg is the founder of the REACH Foundation. REACH is an acronymy for Rewarding Experiences for All Children. The foundation focuses on education and outdoor programs, and in particular stimulating young children to read. It is run by volunteers in cooperation with Mecklenburg. 1 2 3 Frei, Terry (25 August 2013). "Collision Opinions". Denver Post. Retrieved 7 November 2013. ↑ Reilly, Rick (6 November 2013). "Football getting harder to watch". ESPN.com. Retrieved 7 November 2013.